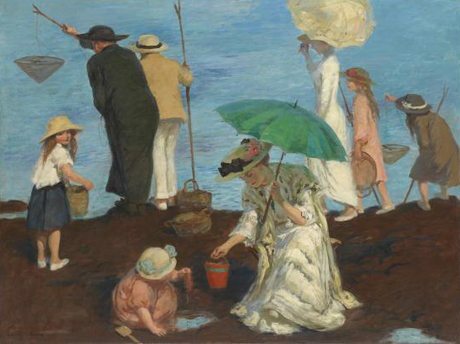 In the landscape of Australian painting history Rupert Bunny (1864 – 1947) is a significant figure. He inserted himself effortlessly into French Parisian life during the so-called ‘Belle Epoque’ or beautiful era. He demonstrated, through his painting a genuine love of his time and the country where he chose to be. He had an innate sensitivity and understanding of the French aesthetic, expression and experience. His landscapes particularly are testimony to his love of the light and the energy of the place. 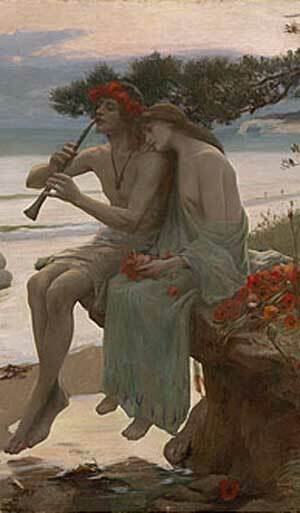 In the past Rupert Bunny has often been criticized for his works of ‘mannered artifice‘. However as former Sydney Art Gallery Director Edmund Capon once pointed out Bunny’s works, particularly those from the late nineteenth century up to the advent of World War I, betray an ‘irrepressible enthusiasm’ that is entirely captivating. Rupert Bunny’s early works are an important statement about a period in western world history when the virtue and worth of women was measured by their relationship to home and hearth. Domestic cares were kept hidden from the Victorian man of the house. He expected a warm welcome from his wife and children in a flutter of excitement to see him after his hard day. He was comforted by the thought of a cozy fire to warm himself; a neat plain dinner with soup and a joint, plus two or three removes to accompany it; order and quiet was valued above all. Prince Albert himself a strict father had a significant impact on this way of thinking. Another influence was a poem called “the Angel in the House” by Coventry Patmore about his wife Emily describing her virtues. Consequently every Victorian Gentlemen wished his wife to emulate the ‘perfect’ Emily, who was endowed with great beauty and innocence of manner and courageously succumbed to acute tuberculosis after bearing her husband six children. 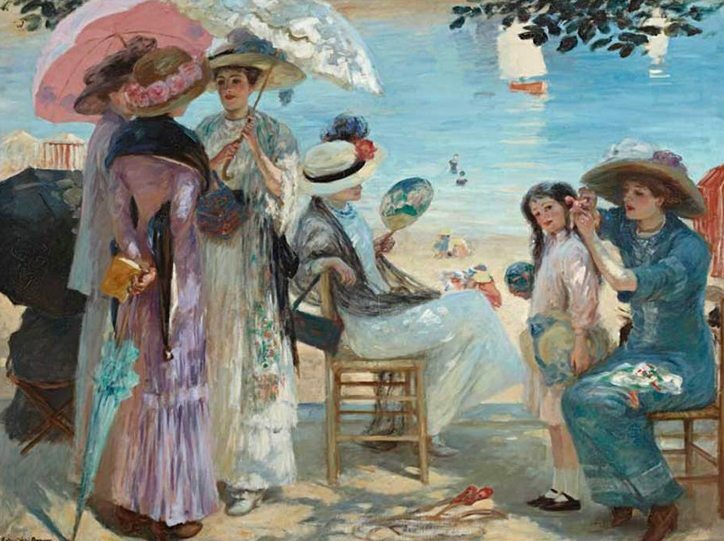 Rupert Bunny was among many artists in England, on the Continent and in America who were, at the time, depicting women beautifully attired, at leisure enjoying themselves in various settings. The imagery supported the prevailing notion that if a woman was able to enjoy and benefit from her leisure activities then it followed that her husband must be a man of substance holding important status in the community. The settings were important. If a woman was depicted in an interior antique furniture in the room implied reassurance of tradition; if depicted outside then sumptuous colour and luminous light enlivening either a rustic or idyllic setting far from the stress of urban life was the new modernity. They also conveyed the idea that the modern woman, who wanted to be a member of a new elite avant-garde would need to take up the challenge, remain interested in, and be influenced by tradition, while both embracing and leading change. She would be a woman for all seasons. Bunny’s series of dreamlike pastorals provoke a reaction, and have been described as ‘a strange and happy encounter between very remote antiquity and naked modernity’. The pleasant place his naked nymphs inhabit exist with, and in critical relationship to contemporary concerns. Rupert Bunny, unlike many other artists was a social being who thrived out and about in society. 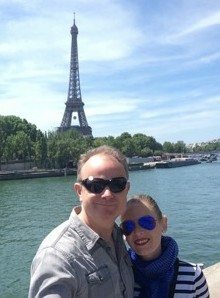 Europe and in France before, and between the wars would have been an incredible melting pot of people and inspirational ideas. As an artist Rupert Bunny’s works prove he thrived in and on the highly charged atmosphere. Works between the wars, and some of his self portraits reveal, he was both struggling and celebrating dramatic and rapid societal changes while exploring new ideologies and examining his self worth. Many of his works like Sea Idyll c1890, Summer Time 1907 and A Summer Morning 1897 and 1908 have always been high on my own list of favourite paintings. 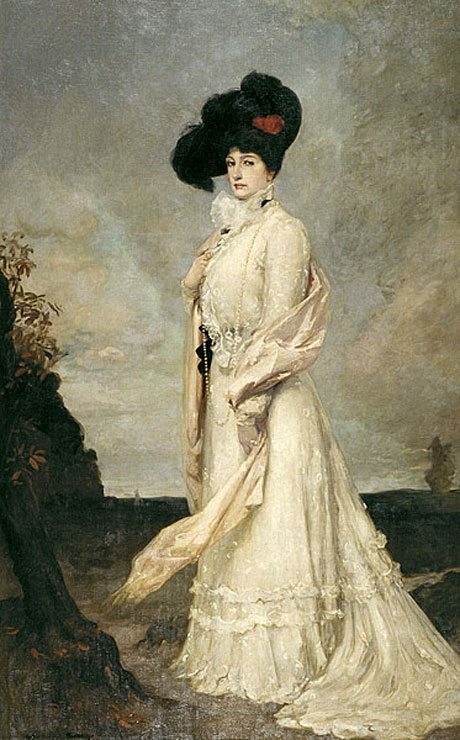 A portrait of Nellie Melba he rendered is a remarkable image of a true woman of achievement. As an ageing aesthete, Rupert Bunny cultivated an interest in orientalism ‘the nexus of reality and fantasy‘…and by the start of World War II was well established as an important artist who had achieved a measure of international fame. He was finally back in his home town of Melbourne after 1933 contributing to the arts scene in many different ways. It was good to know he lived to see the first outstanding exhibition of his work in Australia held at the National Gallery of Victoria in 1946 when 30,000 people paid tribute to a spirited artist who had achieved much. So many artists are not celebrated in their lifetime and it seems surreal that he died within only a short time of this first honour.